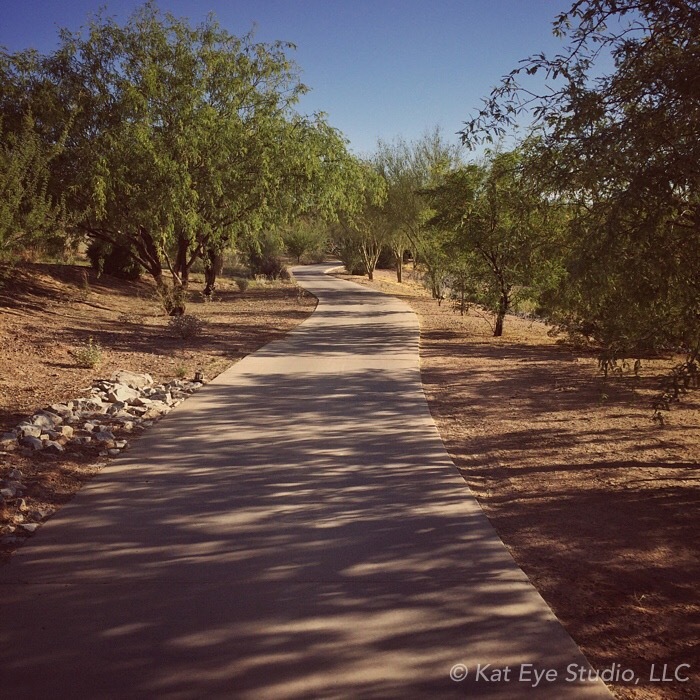 When you hear desert, what comes to mind? Dry, sandy, sparse and prickly are the words that come to my mind. After this weekend I’ve added blooming, living, and vibrant to the list. I was down in Arizona for a girls weekend with my sister, mom, and some other friends. What a gorgeous time to be there! Beautiful sunny weather, not too hot yet, and the desert in bloom. It resets your impressions a bit, doesn’t it? There is this vibrant life there. The calls of the birds and the buzz of the bees filled the air. Beyond just the spring bloom, I do understand why people want to live there. Since I’m always cold, the desire to be warm to the tips of my toes most of the year does appeal. But when I went for a walk Monday morning before leaving, I thought about what it would be like if this was my walk every day. For all that was in bloom, it is still a dry, sparse place. And I realized, nope. I would miss the green, green forest. 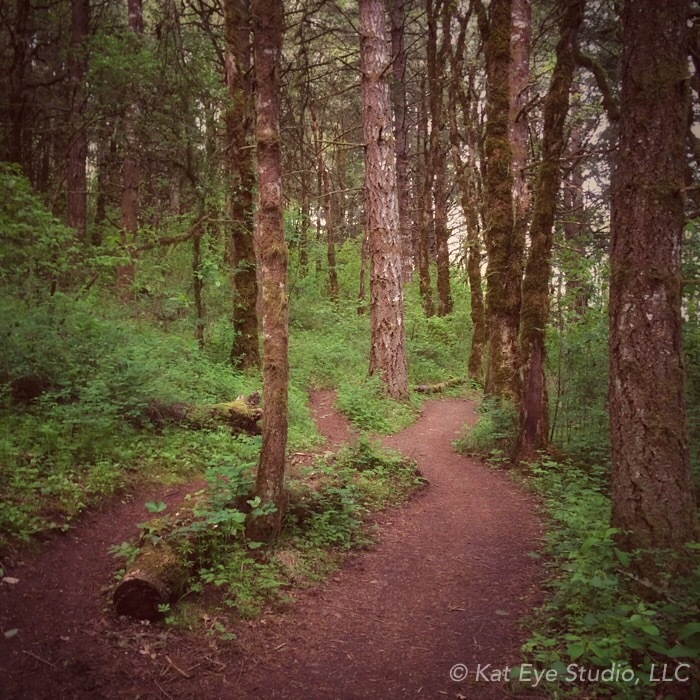 I would miss the trees, and the trails. This image is from my hike yesterday morning, back home. Quite the contrast, huh? I think I’ll hang out here in Oregon for a while longer. My husband, who hates hot weather, is relieved to hear that I’m not planning to drag him to live in Arizona anytime soon. I’ve been quietly struggling with my art lately. For some reason, I’m adrift. I’m not clear about what direction I’m going, what I’m trying to learn, or what’s the next challenge. And one thing I know about myself, I need learning and challenge as part of my creative process. So… I slowly continue to create. To look at the world around me and see what catches my eye. I’m waiting for inspiration to show me the way. This one came along yesterday, and I love it. But it feels as if I had to be dragged kicking and screaming along the entire way. It’s as if inspiration reluctantly showed up for a moment, then ran away. “That’s all you get,” Inspiration says, “I’m outta here.” No clues left as to how to get it to stay. So, dear blog friends, I’m looking for a diagnosis, and a cure. What’s wrong with me? Is it the seasonal blahs? Is it a creative rut? What will get me out of this funk? All I know how to do is keep creating. If I keep creating, maybe Inspiration will stick around long enough to show me the way. Aaaah, breathe deep. Do you smell it? That’s the scent of clean. Spring clean. We’ve gotten the spring cleaning bug in our house. It started as the need for more space in our garage, for my growing pile of art fair booth stuff and for my husband’s new model train modules. So the rearranging commenced. But you can’t rearrange without some reorganizing and cleaning. And that sorting and organizing and downsizing has spread its way into other areas of our house, including my art supply cabinet. And guess what I found in there… Items that I purchased when we were living in Italy, to giveaway on my blog! Apparently I never gave them away while there, they were shipped home from Italy with all of our stuff almost three years ago, I stashed them in my cabinet and forgot all about them. Yikes!! So guess what I’m doing today? I’m finally giving these away! Plus, I found the Photojojo lens set that didn’t work out for me, and I’d love to see these go to a good home, where they might be used. One lined journal, covered in my favorite Florentine paper design. One set of gorgeous Florentine cards and envelopes. 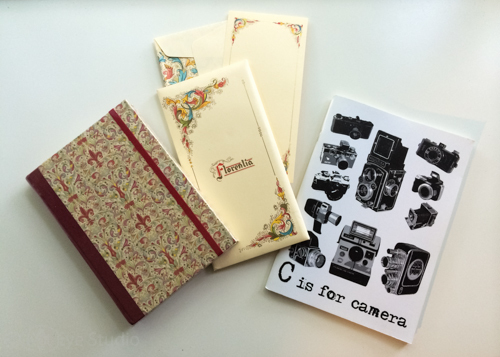 One blank notebook, with “C is for Camera” and vintage camera imagery on the front. One set of Photojojo lenses and case. What’s included is what is shown: Telephoto iPhone lens and cover to attach it to an iPhone 5/5S, a set of three Photojojo lenses (FishEye, 2x Telephoto and Macro. I’ve lost the wide angle lens and cover that screwed onto the macro.) 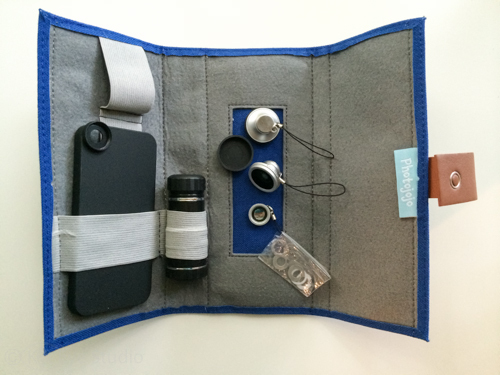 plus magnetic rings for attaching to any camera, and the Lens Wallet to store them. These are used and come as-is. All you need to do to enter the drawing is leave a comment here by Monday, April 28 at 12:01AM EST. I’ll draw the winners at that time and announce them on my blog on Tuesday, April 29. Please, only one comment per person and indicate in your comment if you can use the Photojojo lens set. I want to make sure that goes to a person who can use it, so if your comment doesn’t say you can use it, you won’t be eligible to win it. It’s all in the light. Beautiful, heavenly rays of sunshine through the blossoms. 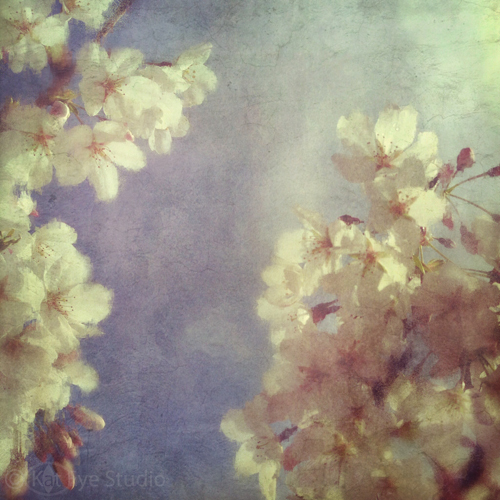 I photographed a lot of tree blossoms in March. 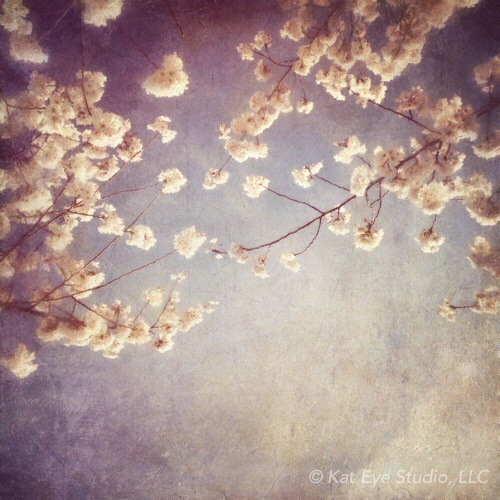 As I looked through the photographs, I realized the photographs were of the blossoms, yes, but they were also of light. Sunlight in the evening, sunlight after rain. The sunlight created the beauty, as much as the blossoms on the tree. So many of these images were taken in what now seem to be fleeting moments. A chance encounter: Me, my camera, and the right light at the right time. A week or two later, the blossoms are now fading and the rains have returned. As I look at this dazzling beauty from a couple of weeks ago, I am full. Full of gratitude, for that brief moment in time, I was able to be fully present. Full of awe, for what I was able to create out of the experience. 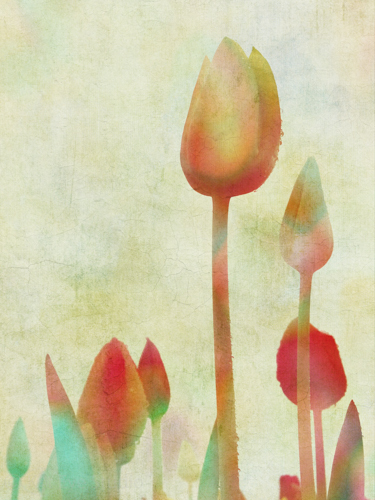 Full of hope, the hope that spring always brings along with it. This is what life is about, isn’t it? Brief moments of time, lived to their fullest. Noticing the sunlight on the blossoms, when it is available. Being present and active and engaged in what life offers up, every day. This moment in time is all we have. It’s where we choose to be; what we choose to see, to capture, to do with the moment that matters. This month’s Photo-Heart Connection brings me an important reminder. I so often live in the future, asking myself, “What do I have to get done next?” No matter what I’ve completed, there is always, always something else on the list. But this morning I’m reminded by light on blossoms, blossoms and light now long gone as I write this, that I can’t always be thinking about what’s next. I need to be present in this moment, living fully in the here and now, to appreciate and see what life is bringing me. This is hard for me. So very hard. 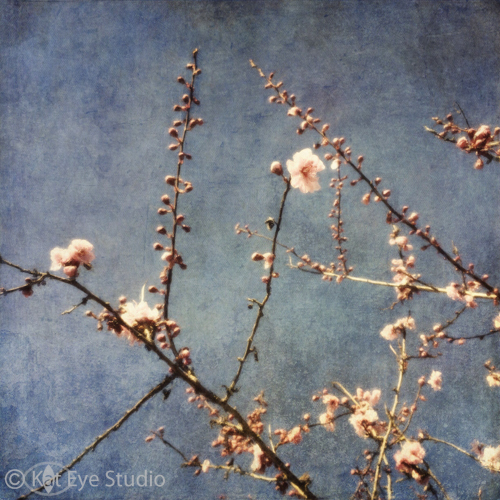 I think I’ll print and hang this image of light on blossoms in a prominent place to remind me of this month’s message: Be present. What is your Photo-Heart Connection this month? 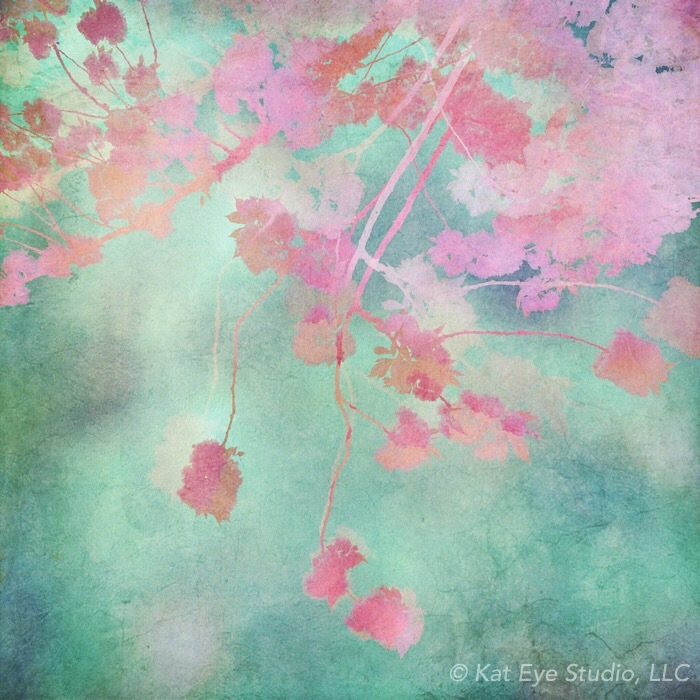 Have you been seeing the light on the blossoms, or are you struggling through some darkness? Whatever the message, it’s important to listen to your heart — it’s speaking through your art. I hope you’ll share what you find with us. I want you to look back, for a minute. Look back at where you were in your creative journey one year ago. Five years ago. Ten years ago. Where were you? What were you doing? Could you have imagined being where you are, today, from that distance in time? One year ago, I was still in the throes of learning mobile photography, trying to figure out how it fit in with my photography practice. This month a year ago, I was in Singapore for two weeks and the Redwoods for spring break. I was in love with trees and the freedom of mobile, but had not yet let go of my security blanket of dSLR. I still toted it along with me everywhere. Five years ago, I was getting ready to move to Italy. I was probably just back to Oregon after a whirlwind trip finding an apartment in Italy. and in the throes of figuring out what we were going to ship to Italy vs store for the duration of the assignment. I don’t think photography was anywhere on my mind, except maybe just the occasional picture of our lives in chaos. I had no clue what the future had in store for me, creatively or otherwise. But I knew I was at the brink of an adventure. Ten years ago, I was probably just trying to keep everything together as a mom of an almost-three-year-old little boy. It’s hard to remember that time, it seems so long ago. My spare time (what little there was) would have included lots of playing with photographs as I created scrapbooks. Photographs mostly of family and events, documenting our lives. A few artistic photographs, that I didn’t know what to do with. Photography was a growing interest, but not the primary art form for me at the time. Could I have imagined, five or ten years ago, that I would be here today? That I would be teaching photography online and in person? That I would be exhibiting my work in galleries? That I would be a keynote speaker at a photography conference? No, I could not have imagined. One year ago, the seeds were being planted for this year’s growth, so these things were within the realm of possibility. But five, ten years ago? No clue. It’s been a journey of long and slow growth. I think “slow” is the natural pace of artistic growth, at least for me. This is what it needs to be. There are creative growth spurts for sure, I can point to a couple of them in the last five years alone, but these are balanced out with periods of slower growth. The slower times are needed for me to integrate what I’ve learned and figure out what I’m going to do with it. Growth takes time, often time where it looks or feels like nothing is happening. 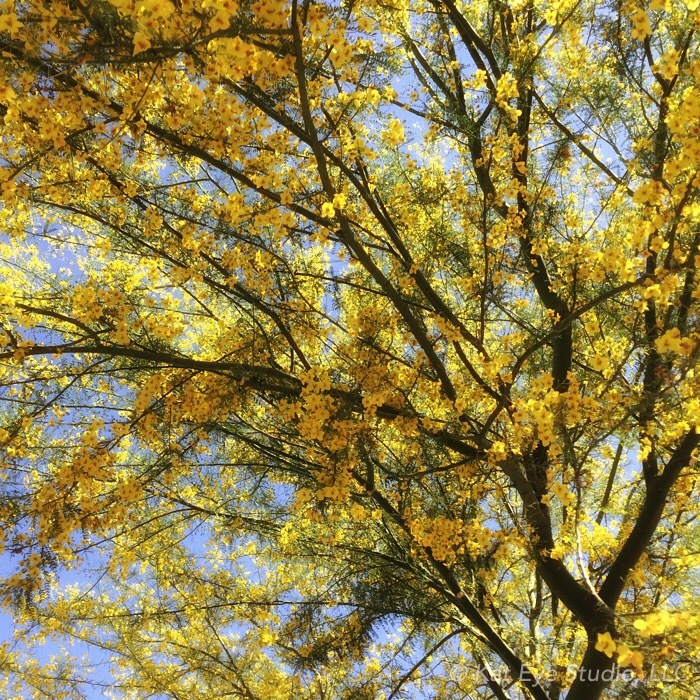 I look at the trees blooming right now, see their amazing blossoms, and think WOW! 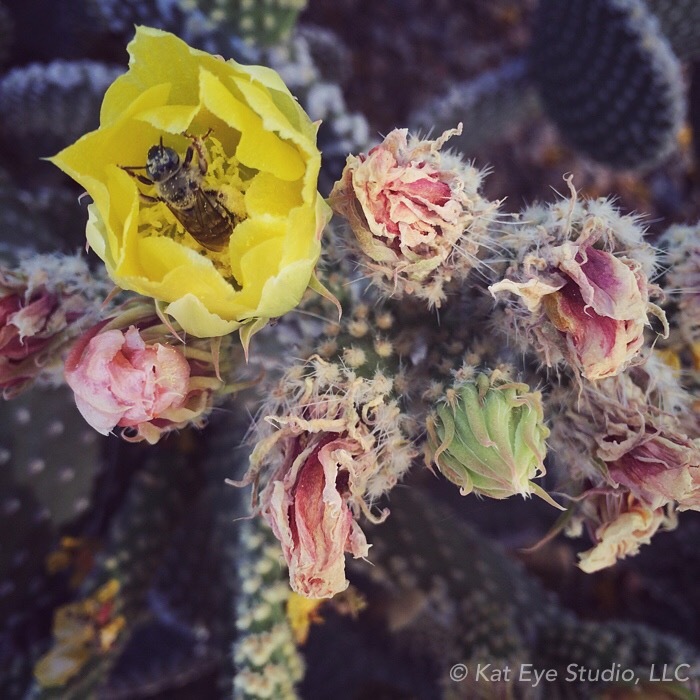 It seems as if all of a sudden, the buds appear and the flowers burst forth. But it’s not all of a sudden, is it? The tree was working toward this, for months. All winter long, while the tree appeared quiet and still on the outside, it was working. Artistic growth is like that, too. It’s hard to internalize, because we might not see this part when we hear about successful artists. We might see an artist with seemingly overnight success, and wonder how they got there. As I meet and talk to more and more artists, working artists who are making their living with their art, I can see that true overnight success is very rare. Most artists achieve their success through hard work, over a long period of time. Their art is growing and changing, as they are, preparing themselves for the big break, if it ever comes. They may experience a lot of rejection along the way, but they keep working, keep growing. So when an artist appears to be “discovered,” when we finally become aware of them, they have likely been working for a long time to get to that point. It only appears as if they burst forth onto the scene suddenly, like the blossoms on the tree. The work to prepare for their success was going on, behind the scenes, when no one was looking. There is an element of luck in artistic success too, don’t get me wrong. I heard this segment on NPR which talked about why some art becomes popular while other art doesn’t. The conclusion of the study was that there is some minimum level of quality, and beyond that, there is an element of luck and crowd influence that determines which pieces of art or artists become popular or successful. That makes sense. Haven’t we all seen art that is fawned over and said, “But Sally’s work is just as good. Better even. Why is that artist so successful while Sally isn’t?” It could just be that element of timing and luck. Now, in all of this discussion, I don’t want to imply there is one definition of success here. Fill in your own definition of success. That could be making a living as an artist, or gaining some notoriety, as is implied above, or it could simply be creating art that expresses your vision. “Success” is a personal thing. Defining what “success” really means to you is part of the growth process, too. So what can we do, to be ready for that success, however we define it? How do we prepare, if there might be an external element of luck or timing involved? All we can do is continue to grow. Continue to do the work of becoming better at our art. Continue to take one step after another on this creative journey. Slowly, surely, moving ourselves forward. Looking out for opportunities that may arise, taking risks, and trying new things. Showing up. That’s all we can do, day by day. Sometimes, when the growth is slow, it may feel as if nothing is happening. But it’s when we look back — one year, five years, ten years — we can see how dramatically things have changed. And we can see where our hard work made that change happen. How our effort and growth got us to where we are today, artistically or otherwise. So let yourself grow slowly. Be the tree that is getting ready for spring. Don’t worry if the tree next to you is blossoming, bursting forth into spring, and you are not. You are still getting ready. Your time to bloom will come.